Oklahoma, otherwise known as the Sooner State, has multiple gambling activities available for residents and tourists to take advantage of. There are domestic brick-and-mortar gambling locations for local players to use, as well as, licensed offshore online casinos, poker, bingo, and sports betting options legally available. Our team of US online gambling specialists developed this page exclusively for residents of the state of Oklahoma. Players will find helpful information in this guide regarding the best legally licensed offshore online Oklahoma gambling sites, as well as, applicable gambling laws to both domestic OK gambling markets, and offshore gambling offers. Is Online Gambling Legal In Oklahoma? Licensed offshore online gambling sites are not prohibited OK by state or federal laws. Since the gambling laws in Oklahoma do not explicitly prohibit licensed offshore sites from being used, these are technically allowed. However, the state has yet to authorize domestic online gambling platforms and thus punishes those found operating a state-based online gambling site. Therefore, Oklahoma residents primary legal online gambling option as of this moment are licensed offshore online gambling sites. We’ve provided a list of the best available online gambling sites that are Oklahoma friendly in the table below. Each one of these brands has been vetted by our team of online gambling analysts for items like legal licensing and regulation offshore, game/betting line selection, security features, customer support, and bonus promotions. Which Types Of Online Gambling Options Can I Find In OK? 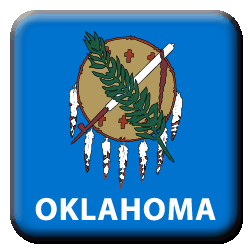 In Oklahoma, options for online gambling must be accessed through licensed offshore online platforms. These sites cover multiple venues, including casino gambling, poker, sports betting, horse betting, and bingo, among others. Oklahoma was considered a frontier state back in the early days and gambling flourished in the local saloons. This came to a halt in 1916, when an anti-gambling law was passed in the state. Over time, certain forms of gambling were legalized in the Sooner State. In 1982, pari-mutuel betting on horse races was legalized. Later on, gaming machines and off-track betting were permitted at racetracks. In 1987, the Choctaw tribe hosts its first high-stakes bingo game. In 1992, Charitable gambling was permitted; The state formed several Class II tribal gaming compacts with OK native tribes. In 2004, tribes are permitted to offer Class III games. In 2005, the Oklahoma Lottery begins and enters a multi-state lottery agreement to offer the Powerball. Which Forms Of Gambling Are Legal In Oklahoma? When Did OK Tribal Gambling Come Emerge? Federally recognized native tribes living in the state formed gaming compacts in 1992. However, in 2004 tribes were permitted to offer Class III games in their casinos which allowed them to expand their venues. Which Other OK Laws Cover Gambling? Section 21-981 of the Oklahoma Statutes defines a bet as “a bargain in which the parties agree that, dependent upon chance, or in which one of the parties to the transaction has a valid reason to believe that is dependent upon chance, one stands to win or lose something of value specified in the agreement.” Tribal gambling, charitable gambling, and the other legal OK gambling forms are exceptions to this rule. Another law is Section 21-941, which outlines the components that constitute illegal gambling. The main target is pointed at individuals operating illegal gambling rackets. Anyone found in violation of operating an illegal gambling ring is committing a felony and faces up to $2,000 in fines and ten years in prison. What Are Online Gambling Bonuses? Bonuses are a unique component of licensed offshore gambling brands. They provide users with funds to gamble with at no additional cost to them. New users can take advantage of welcome bonuses that match a portion of their deposit, and frequent players can use reload bonuses which work exactly the same way. There are several bonuses reserved for casino specific-games, slots, poker, sports betting, bingo, tournaments, cryptocurrency deposits, live betting, mobile users, and much more. However, bonuses come with attached conditions which must be met before withdrawing. How Can I Fund My Online Casino Account? Licensed offshore OK online casinos happily accept various deposit methods from major credit and debit cards to preloaded gift cards, cryptocurrency, and various digital wallets. However, US players may encounter more challenges when using major debit or credit cards like Visa or Mastercard to deposit funds online at a gambling site due to the UIGEA. What Features Can I Find At Online Poker Sites In Oklahoma? Licensed offshore OK online poker sites offer numerous helpful features for novice and experienced poker players such as multi-hand and table play, anonymous tables, note keeping, hand history, player tracking, tournaments, bonuses, and much more. What Sports Can I Bet On Online In Oklahoma? Licensed offshore OK online sportsbooks offer wagering options on numerous available domestic and international sports leagues, teams, games, and events. Available betting lines can be for domestic major, minor, or niche sports, olympic events, entertainment, and politics. These sportsbooks want to offer bettors a wide range of options and even offer live betting for in-game wagering. What Bingo Games Can I Play Online In Oklahoma? Licensed offshore OK online bingo halls offer numerous themed bingo games reflecting mythology, movies, series, superheroes, and more. Other available bingo games are ball variation games from 30-ball bingo to 60-ball, 75-ball, 80-ball, and 90-ball bingo games. Remaining available bingo games include side games which mirror casino-style games and bingo chat games which offer side games and chat functions within the licensed offshore online bingo’s chat room.